This book was created as a resource to assist equine veterinary technicians, assistants and other support staff working in a practice, as well as, to be used by students going through an AVMA/CVMA accredited program of study. It is also the required text for those enrolled in our AAEVT Certification Program. Schools may also purchase this book through Wiley-Blackwell for use in their programs. AAEVT’s Equine Manual for Veterinary Technicians is a complete compendium of information on the care and treatment of horses for equine veterinary technicians. Highly accessible and easy to use, the book builds on the basics of equine care to thoroughly cover equine information and skills. 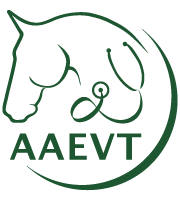 Carefully organized for easy reference, AAEVT’s Equine Manual for Veterinary Technicians brings together the body of knowledge on equine veterinary technician education and practice in a single quick resource. With chapters on key areas such as nutrition, reproduction, anesthesia, and technical procedures, the book covers vital skills, training, and technical information. 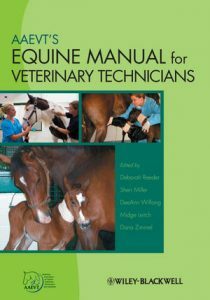 AAEVT’s Equine Manual for Veterinary Technicians is an invaluable guide for qualified equine veterinary technicians and assistants, particularly those earning their equine certification, vet tech students, and equine practices. Sheri Miller, LVT is a former President of the American Association of Equine Veterinary Technicians. DeeAnn Wilfong, BS, CVT is a former President of the American Association of Equine Veterinary Technicians. Midge Leitch, VMD, DAVCS was the Clinician in Radiology at New Bolton Center at the University of Pennsylvania’s School of Veterinary Medicine.